They're sleek, elegant and fast. They are the graceful but industrious greyhound dogs. Just when you thought--what else is there to do inbetween the Everglades to the west, and the celebrity-spotted nightclubs along the beach to the east? 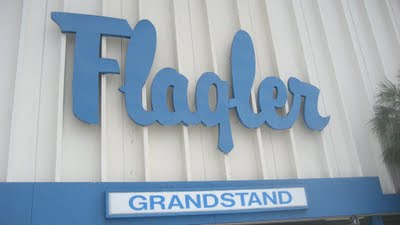 Plenty, including the Flagler Dog Track in Miami. If you're a modest gambler that's more intimidated by the 24 hour energy of smoke-filled Vegas, then this is the place for you. Imagine a day in the fresh outdoors, easy-going small crowd, wagering a modest bet and the adrenaline rushing from watching the most beautiful creatures contract and expand, their sleek lines the envy of a professional dancer or competitive athlete. Bring the kids and let them pick their candidate of choice! This may be a good way to introduce and educate your children about gambling. Tuesdays are lucky days with $4,000 bingo prize. The action is every Tuesday at 12:45pm followed by live racing at 1pm. On Thursday nights is Doggie Dinner Theater which offers giveaways, food specials and dancing waitresses. From 8pm-11pm every Thursday. Recently, they've added 700 of the most popular Las Vegas style slot machines and baptized the new facility name: Magic City Casino. From penny machines to high-stakes action, there's something for everyone. But you must be at least 18 years of age to enter and play. So leave the younger kids with the babysitter! But bring the parents and grandparents! To kick off the New Year, join the party with live music, dance contest, drink specials, champagne toasts and more. The event is free! Add this to your list of Miami Staycation events!